This morning Mr. Rosenberg took the guys on a walk. Down the street, they ran into our friend Lisa who was walking her lab, Blue. Blue sniffed Levi and then Teddy got in between the two of them, apparently to "protect" Levi. Then Teddy tried to really display some dominance by attempting to "mount" Blue. I have never seen Teddy do this in all my years of being Teddy's friend. He tried mounting a throw pillow once but that was short-lived and just embarrassing for everyone involved. Never seen him try it with another animal. He's taking his job as brother extremely seriously. Regarding the photo above: We're trying the next size up of inflatable ring/cone. Levi's learning to balance his head on it like a flotation device/pillow. So far so good. Teddy has been staring at the bottom of the front door for going on twelve minutes. Sometimes these guys are just weird. And I love them. 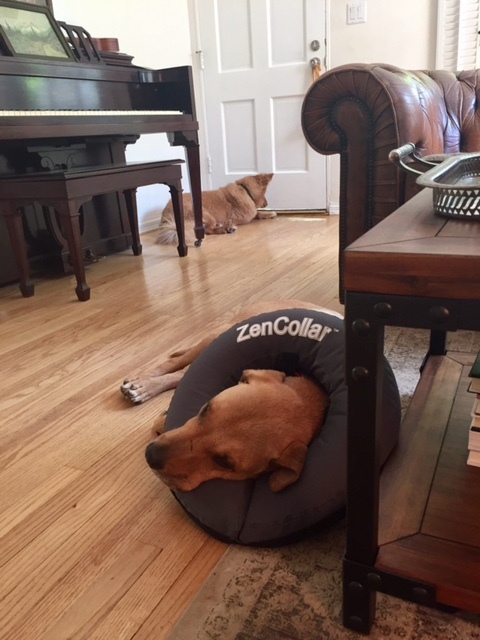 I've never seen a blow-up collar that huge. How many weeks of torture does Levi have to endure? Also, one of my favorite things about dogs is that sniffling at the bottom of the door thing. Cracks me up every time.